When we think of Abstract Expressionism, we usually think first of dynamic brushwork. That is certainly the case with Franz Kline. However, in the case of Kline’s work, one tends to think of work that is predominantly a palette of black and white. Well, I’m here to debunk that perception, after seeing a gorgeous Kline from the Hirshhorn Museum in Washington. I also offer you this gorgeous piece from the National Gallery. You know what a sucker I am for color! 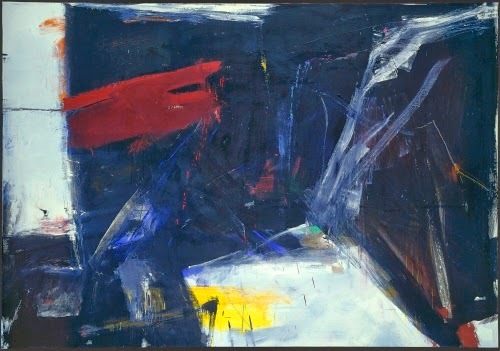 One reason Abstract Expressionism so excites me is because it bucked the trend of Social Realism and American Scene Painting that flourished during the Depression (1929–1940), and the movement was intuitive, stressing process over subject matter, in which the finished work of art was the map of the process. Kline was born in the eastern Pennsylvania coal-mining region, growing up with industrialization. He studied art in academies in Boston and London, settling in New York in the late 1930s. Unlike many of the other abstract expressionists, Kline was deeply affected by the tradition of Western painting, from Rembrandt to Goya. His work of the early 1940s primarily depicted figures and urban scenes tinged with social realism, the anathema of the other members of the New York School. By the late 1940s he was painting portraits in a style that was gradually tending towards abstraction. Kline became very interested in drawing during the 1940s, producing numerous sketches and studies for his painted works, often on pages torn out of the phone book. He made his transition to non-objective abstraction, according to a New York art critic, when one day in 1949 he used an overhead projector and saw the implications of his sketches on a large scale. Focusing on details of these sketches in projection created monumental, free form abstract images. He made his first large-scale black and white abstraction in 1950. In C & O, we see Kline's work take a turn toward color, after black and white dominated his work in the 1950s. Only in the late fifties did color play a part in his compositions. Although aware of the gestural experimentation of the other abstract expressionists, Kline did not share Pollock's interest in myth, Rothko's interest in the sublime, or de Kooning's emphasis on spontaneous gesture. Kline worked out his compositions in advance. He painted on unstretched canvases tacked to his studio wall using house-painting brushes. His line is rugged but controlled, forming architectonic shapes that hark back to his interest in industrial and urban imagery. Like Pollock late in his career, Kline began to digress from the formulaic “canon” of Abstract Expressionism that was emphasized by the gallery system in New York. Studio Activity: Have students draw a portrait, still life, or landscape in pencil. Then have them focus on one particular area in close-up, and translate the detail into gouache or tempera paint so that the original composition is not recognizable, and an abstract aesthetic is achieved.